I don't usually have much time to read the forums, but this was brought to my attention. I am the president of the 2 Cs and a Bee Beekeepers Assoc. to which Mr. Nale belongs. I thank you each for your support and would like to let you know what has transpired up to this point. Mr. Nale and his sons came to our beginner beekeeping classes and multiple meetings prior to actually getting bees. He was advised to check local ordinances and zoning before hand. This he did and has a sworn statement from the borough manager at the time to that effect. This person is now a county commisioner. He had the bees on the property for about three years with no apparent complaints. He maintained a water source right by the bees and surrounded the bees with shrubbery making the bees fly up out of the line of travel of anyone close by. His bees were well maintained. This July he was approached by the local codes enforcement officer saying there was a complaint and he was going to have to move his bees out of the borough. He tried to reason with them but it did not work. They offered him an alternate location outside the borough which he refused, as he felt there was no reason he should have to move them. At this time they issued a citation under a property maintainence code. 1. Grounds, buildings and structures shall be maintained free of insect, vermin and rodent harborage and infestation. The proposed fine at the time was $1000 a day and/or 30 days in jail for each day he was in noncompliance. That evening, Mr. Nale and his son, along with myself and eight other beekeepers went to the local borough council meeting. We presented a packet of informational material to each council member on the value of honeybees and various other educational handouts on beekeeping. Mr Nale and his sone addressed the council and ask them to consider this. They would not let me speak on behalf of Mr. Nale or beekeeping as I was not a resident of the borough. After the meeting we met with the council president and a few of the other council members privately. Many phone calls and private meetings were held, though they seemed sympathetic, the matter proceeded. We went to the next meeting and tried to get them to listen to reason but to no avail. They decided to turn the matter over to the magistrate. After the hearing date and location was changed three times the hearing was held on the 20th of November at 3PM. The county commisioner who was to speak for Mr. Nale had a death in the family and could not show up and they would not accept her written statement into evidence. Dennis VanEngeldorp , Acting Chief Apiarist for the state of Pennslyvania was to attend but was involed in a car accident and could not attend. I did attend and attempted to testify in his behalf but was severely limited as to what I could get in by the format of a hearing. The magistrate made his ruling based on the definitions of the wording of the ordinance. He looked up infestation and it can be read as ,"presence". and harborage can be read as "providing a safe place of refuge". 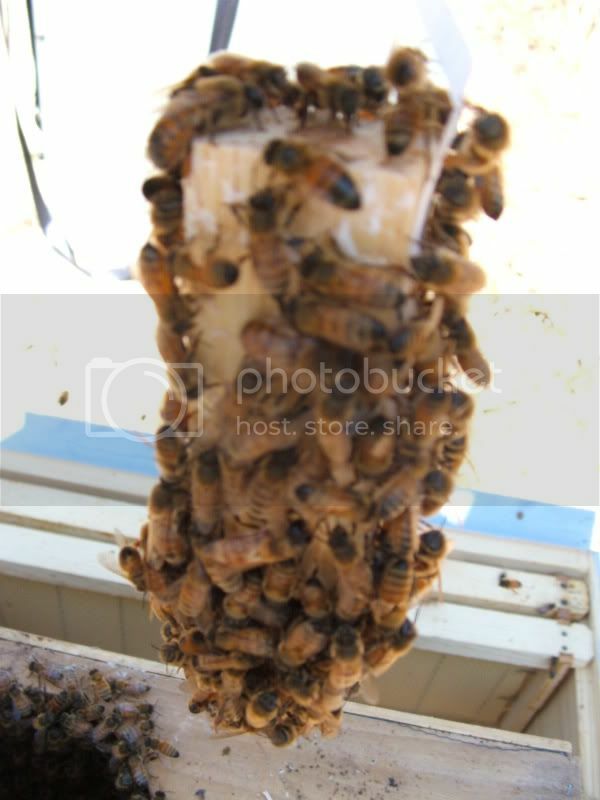 Both of which we can not deny, the bees are present and are provided a safe place of refuge. He fined Mr. Nale $50 and he must adhere to the order. He also advised him on his right to appeal. This is where it stands as of now. I am waiting on Mr. Nale to make a decision on how he wishes to proceed, He is the only beekeeper we have who has bees in that borough. I realize this is not fair or reasonable. But we must deal with reality as it presents itself. We are not done here, just trying to work within the system. We have been offered whatever help they can provide by the Pa State Beekeepers Assoc., Maryann Frazier from Penn State, Dennis Van Engeldorp, and many others. Thank you for your support. That's though, Mr. Nale has been railroaded. 1. Witnesses were not allowed to testify, 2. a written statement was not accepted into evidence in justifyable absentina of the witness, 3. The courts selected definitions of eky words was arbitrary and slanted in order to find the defendant at fault, 4. International treaties, that apply and the court should have been aware of, such as NAFTA, which recognizes bees as beneficial plants and exempts them from nuisance ordinances were ignored. 5. The Magistrate was obviously biased based on his actions to exclude testimony and selection of definitions and should have, therefore, recused himself as required under the ABA code of ethics. I would post an immediate appeal based on those facts and see what happens next. gotta love city folks. they think their food magically appears in safeway over night. Ok, the misapplication of ordinance in this case is absolutely aggregious. Aren't judges also supposed to read the spirit of the law as well, not just all of the absolute possible applications? He did whatever he wanted to, not what the ordinance was created for. So I could go to the neighbors yard, turn over some leaves and complain that they are harboring pillbugs? Complain that they aren't killing the ants in their sidewalk? C'mon, there are fleas on all of the squirrels, and those are rodents!!! What about the wasps, and the aphids on the trees? I agree, this is absurd. They are taking the path of least resistance to placate the most obnoxious voice. Thanks for speaking up on the behalf of the Nales!! Sounds like you put a lot of work into something that was probably completely infuriating. shadetree thank you for taking the time to update us on this matter. Would you please let them know that I wish them the best on this matter. "Grounds, buildings and structures shall be maintained free of insect, vermin and rodent harborage and infestation." Grounds is the key word here. "The magistrate made his ruling based on the definitions of the wording of the ordinance. He looked up infestation and it can be read as ,"presence". and harborage can be read as "providing a safe place of refuge". What a stretch, quite unbelievable. Now I would have to argue that infestation applies to he/she that has acquired the infestation, so in fact in this case the neighbor didn't have an infestation Mr. Hale did and was perfectly fine with his "infestation" and was taking proper care of his "infestation". We are all infested and BTW, I am infested and I approve of this message. Completely foolish. You have a father and son who have a hobby that allows them to spend time together and actually do something of value, and a busybody neighbor and no nothing elected officials try to put an end to it. I hope the magistrate and neighbor end up with an infestation of a personal sort. Thats it. I have had it. we should all take our bees and strike!!!! Yes, no more pollinating from our hives. Lets show them who is in charge and how inportant our beees can beeeee!!! One or two try w/o pollination services and they will be on their collective knees. I wonder if that would be possible :? I dont really think any strikes goes very far because people still need their money to keep up with their bees. I would think the strike would help change some laws but not all. The feds set their laws, the states can be more restrictive, and the local laws can be veen more restrictive. People are just scared of bees like they are of snakes, spiders, and mice. I think the best thing would be the education of the bees. I hope reason can win out here. There is always some neighbor that thinks his rights are greater than others. If there is equal justice then someone in the court should see the light. Good luck, hope this works out for you, and keep up a good fight. It certainly seems that there could bee some bias decisions being made. It appears that the main bias was the judge and that can never be good, unless there's an appeal with a different, more open minded judge. It appears to me there could be more that just bias thinking. In my experience, political influence (money) has a great deal to do with decisions. :( :-x IMHO.